Ghost Mountain Inn - Mkuze Accommodation. At the foot of the legendary Ghost Mountain in Mkuze, northern KwaZulu Natal lies the privately owned 4 Star Ghost Mountain Inn. This intimate and beautiful hotel is the ideal location from which to explore the array of wildlife and coastal reserves in Maputaland and the Elephant Coast. Nature enthusiasts will appreciate the abundance of wildlife and the scenic splendours of this rich and diverse region during game drives, guided walks and boat cruises in the company of knowledgeable rangers. Tiger Fishing is arranged on Lake Jozini while birders can enjoy one of Southern Africa's top birding destinations with over 450 species. Alternatively escape and be pampered at the Ghost Mountain Spa. Enjoy an Terres d Afrique exfoliation and body wrap with natural South African products or a Dermalogica facial treatment. The spa features a steam room and relaxation area with private plunge pool to rest in between treatments. Those who prefer the relaxing sound of birdsong and the warmth of the African sun will find their respite at the poolside within the glorious gardens. In addition to well priced Bed and Breakfast rates, Ghost Mountain have put together excellent packages for 2 nights and 3 nights respectively, including a complimentary dinner, a 30 minute back and neck massage and a boat cruise on Lake Jozini. The three day package includes a game drive in Mkhuze Game Reserve with a picnic lunch. Hike up Ghost Mountain and take in the heart stopping view of the Lebombo Mountain Range and the plains beyond. Nature lovers will enjoy the Mkhuze Game Reserve, where the range of wildlife includes both black and white rhino. The area is a bird watcher's paradise with the endemic Pinkthroated Twinspot, Rudd's Apalis and Neergard's Sunbird, among many other specials such as African Broadbill and Green malkoha. Enjoy a guided walk through the rare and unique giant sycamore fig forest and hear the haunting cries of the Trumpeter Hornbill echo through the treetops. Take a trip to the Greater Isimangaliso Wetland Park - a Word Heritage Site - Hluhluwe-Umfolosi Game Reserve, Ndumu Reserve or Tembe Elephant Park, home to the last wild elephants in South Africa. Visit unspoilt Kosi bay and see the traditional reed fish kraals used for centuries by the Tonga people. Lake Sibaya is an ancient inland lake and nearby Sodwana is one of the world's top scuba diving and fishing destinations, where the waters along this pristine coastline are warm and crystal clear all year round. 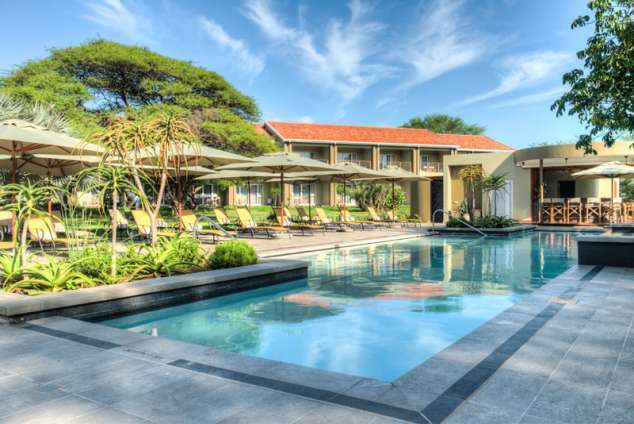 The Ghost Mountain Inn offers over 550 square meters of indoor function space that combines the stylish comfort of Zululand's Finest Country Inn with fully equipped facilities needed for any meeting or event. From intimate meetings or celebrations to romantic garden weddings under the giant fig trees and banquets for up to 160 people, the Ghost Mountain offers the ideal venue. At Mkuze, turn left off the N2. Continue straight past town to a T-junction and turn left. After 400m the hotel will be on the right hand side. 29917 page views since 01 Oct, 2004.